Many philosophers have their own interpretations of the state of nature and the true nature of mankind. Hobbes depicts one of the first accounts of the state of nature and followed by a theory of sovereignty. He examines the trade-off between security and freedom as the individual, in joining society, is promised protection and security in exchange for the surrender of his natural rights. The outcome of this exchange, however, very much resembles a dictatorial state. As such, man escapes the insecurity of the state of nature only to be deprived of his natural rights in a tyrannical commonwealth. With this frightful account of the state of nature, Hobbes urges individuals to leave it and instead enter a commonwealth. As such, men give up their liberty to join a commonwealth in which they are guaranteed security. This security is guaranteed by a sovereign who has the ability to institute laws. In joining the commonwealth, individuals must give up their extensive natural rights which are defined as “a right to everything, even to one another’s body.”  Yet, unlike in the state of nature, there is “justice” in the commonwealth – although this justice is defined solely by what the rule-enforcing sovereign deems to be right or wrong. Therefore, as long as the sovereign has uncontested power over his citizens, a Hobbesian conception of justice exists. 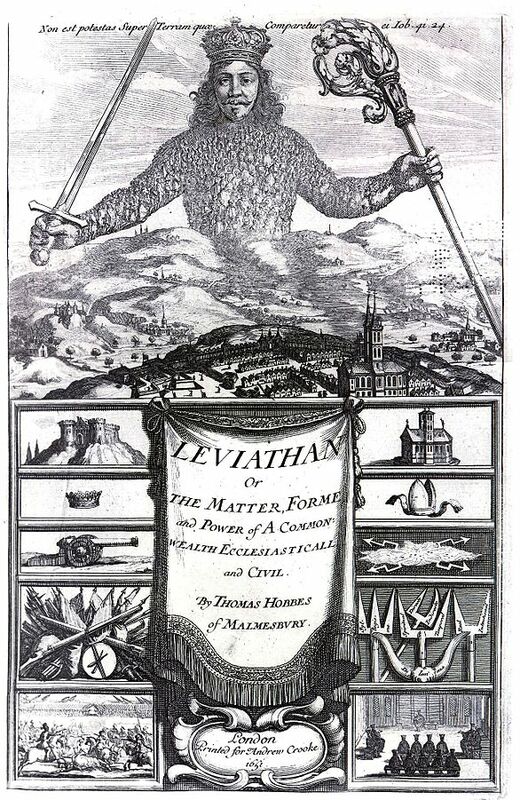 Photo is public domain under PD-1923; originally published as frontcover of Leviathan by Thomas Hobbes, engraving by Abraham Bosse. The agreement to this exchange of power is known as a social contract and its product is the definition of justice in society. Contrary to Locke, who encourages a social contract between individuals and the source of authority, Hobbes excludes the sovereign by proposing a social contract between only the commonwealth’s citizens. As a consequence, the sovereign is not bound to any covenant or restriction. Instead, he is merely the source of coercion that encourages individuals’ compliance with the contract. Justice cannot be defined without placing the sovereign above the contract. Therefore, Hobbes’s account of the ideal commonwealth, which is governed by an absolute authority with immense arbitrary power, resembles a dictatorial or tyrannical state. However, Hobbes does concede that once the sovereign is unable to protect the citizens they have the right to fight back. When this occurs, individuals once again enter the state of nature. If, however, the citizens choose to refrain from taking such action, the sovereign rightfully continues to maintain power over his citizens, even if he has failed to guarantee their security. The legitimacy of the sovereign’s power is thus not bound by the acceptance by his people. Instead, “the rights of sovereigns are drawn exclusively from the nature of sovereignty itself.”  This unequal balance of power creates a tyrannical, totalitarian state as citizens must simply accept and follow a leader who may do as he pleases. In other words, the sovereign appears to retain the “right to everything” he enjoyed in the state of nature, while the citizens alone must relinquish this right. Overall then, Hobbes’s view of a commonwealth mxay be too demanding. After all, it gives man a way to gain security and escape from the brutish state of nature only to be subjected to other impositions, most prominently, the obligation to blindly follow the sovereign’s authority. Following a sovereign with absolute power and no restrictions will continue to instill fear in individuals. Living in this tyrannical state restricts the freedoms that allowed men to harm others in the state of nature, and it also, potentially, limits other freedoms such as freedom of expression or of religion. 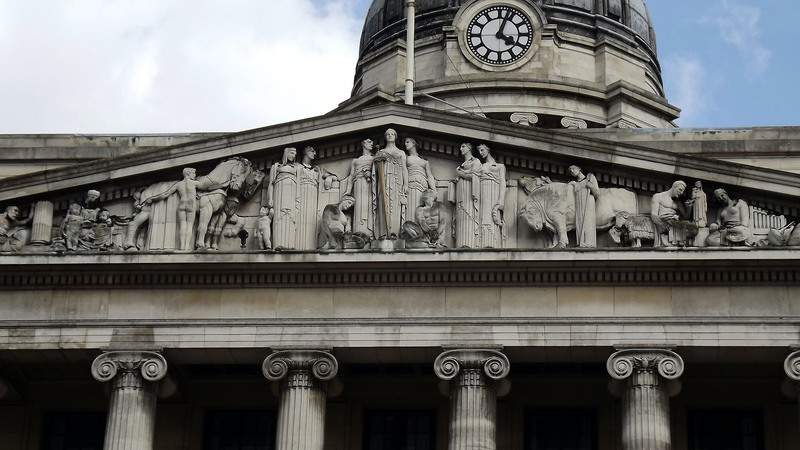 Essentially, the sovereign may restrict freedoms in whichever way he chooses and thus, though life becomes secure, it also becomes severely limited. The prevalence of these fears and limitations thus raise the question of whether living in the insecurity of the state of nature is truly worse than living in a tyranny. As such, the trade-off that Hobbes demands might simply not be justified. Feature image by cowrin via Flickr Creative Commons. Thomas Hobbes, Leviathan, ed. Ian Shapiro, (New Haven: Yale University Press, 2010), 78. Tom Mouritz, “Comparing the Social Contracts of Hobbes and Locke,” The Western Australian Jurist 1 (2010): 123-127. James Hurtgen, “Hobbes’s Theory of Sovereignty in Leviathan,” Reason Papers 5 (1979): 55-67.